Lithographed by Henri Gillet 1854 (April-August): 5 c. pale brown, wmk. pos.1, an exceptional used horizontal pair from the right of the sheet showing the four marginal watermark lines and full 14 mm. sheet margin with the Jubilee line at right (and very rare thus). The pair with huge margins all round and portion of adjoining stamps below, cancelled by two strikes of the target handstamp in black. Splendid and extremely rare: Gerhard Blank recorded just four examples with complete sheet margin. Cert. 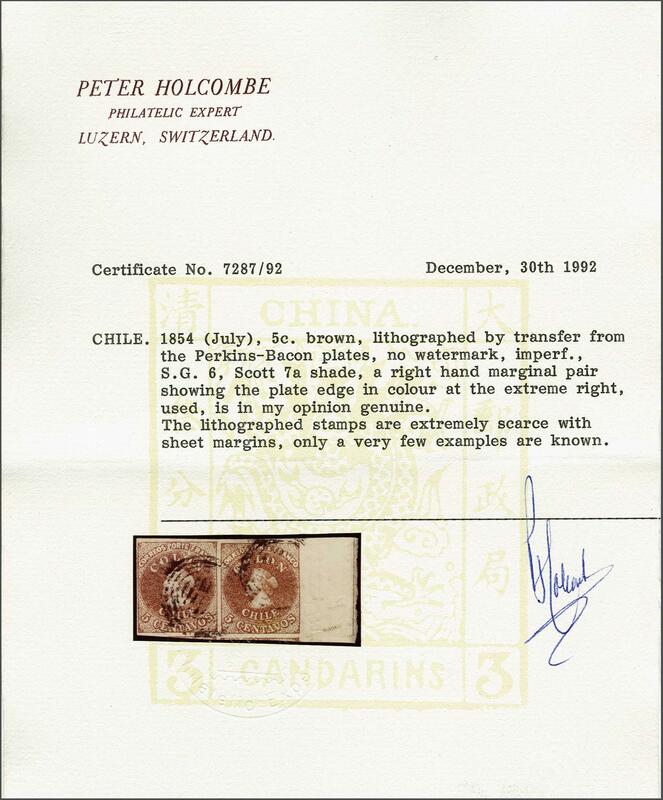 Holcombe (1992).rnProvenance: Collection Count Welczek; Collection Gerhard Blank, RL, Dec 1991, lot 1056.